Young Nan, sitting on a train! Young Nan, you&apos;re drinking tea again! 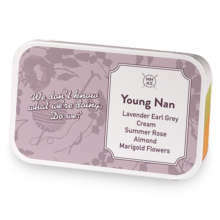 Get into the Young Nan spirit with this floral marzipan Earl Grey tea. 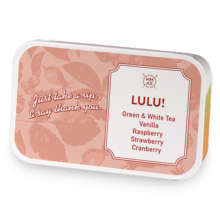 Featuring lavender and almond flavours with a hint of cream, rose and lots more lovely florals. This tea contains a high level of caffeine | Steep at 100°C for 3 minutes. Young NanOoLingLongLingMajesTEAAAMr. 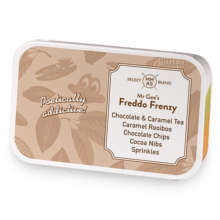 Gee's Freddo FrenzyCrow In The WallLULU! 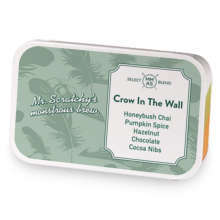 This tea is part of the Matt Morgan Mmas sampler set which includes six community favorites packaged in spiffy metal tins. Perfect for displaying in your tea cupboard or for refilling as a tea transport vessel while on the go. 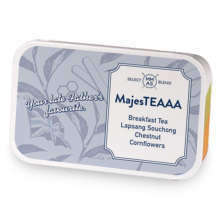 Also makes a great gift for your Fandom and tea-loving special someone.